For over 20 years, Ironwear® has been the leading supporter of medical research focused on how to use wearable weights to improve physical and mental health. Around the world, Ironwear® is supporting a wide range of research including reducing recovery time for joint replacement, increasing bone density for women, and improving coordination for MS patients. Working with Harvard Medical School, Ironwear® created the first safe weighted vests for older adults. Harvard has used Ironwear vests over the years to study how to improve the health of older adults and to prove that older adults can live longer, independent lives by training with the Ironwear vests. For children of two years and older, Ironwear® was the first to create children’s weighted vests, and these vests are now used for the treatment of ADHD and other sensory disorders. For athletes in all different sports, Ironwear® has been developing new specialized products and supporting medical research to better understand how wearable weights can enhance an athlete's strength and endurance. Mississippi State University is the latest recipient of Ironwear® support. MSU just received a donation of 24 Ironwear® Uni-Vests from Ironwear for their medical study on the use of weighted athletic training for increasing athletic performance. Ironwear®’s goal is to improve life by helping to solve one person’s problem at a time. Invented and Made in the USA. For the last two decades Ironwear® has been a leading edge inventor and manufacturer of health and performance enhancing products. Ironwear®'s design, manufacturing and warehousing operations are located along the Allegheny River in Pittsburgh PA. Ironwear® only manufactures and sells products that it has invented. Ironwear® produces its own polymers, and does its own compounding and injection molding, Ironwear® also cuts and sews every Ironwear product in house. This makes it possible for Ironwear® to provide what others cannot. Ironwear® designs and manufactures all its own products. Ironwear does not distribute products made by other companies, and it only sells its own designs. It is said that imitation is the most sincere form of flattery, and Ironwear® products are among the most copied around the world. But none measure up to the real design, quality, function, and warranties of true Ironwear® products. Ironwear® supports the local economy by using US Steel, US Rubber, and US Fabrics. Ironwear® employees do all the production work so we can create and maintain the highest possible quantity. At Ironwear® we work to constantly improve every product we make. 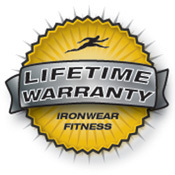 For all these reasons, Ironwear® is the only company of its kind to offer a lifetime warranty on everything we make. Once you buy an Ironwear® product we support you. When you call our factory you get to talk directly to a person in Pittsburgh who knows our products and can help get your questions answered quickly. We also offer quick response online customer service by e-mail. In addition, Ironwear® has a network of athletic trainers, therapists and doctors around the world who can help you buy and properly use Ironwear® equipment. Ironwear® products are available online and through Ironwear® Trainers and Retailers around the world. Ironwear® is a true design and manufacturing operation located in Pittsburgh, PA. All of our design, manufacturing and warehousing is done in house, and we do not out-source anything. 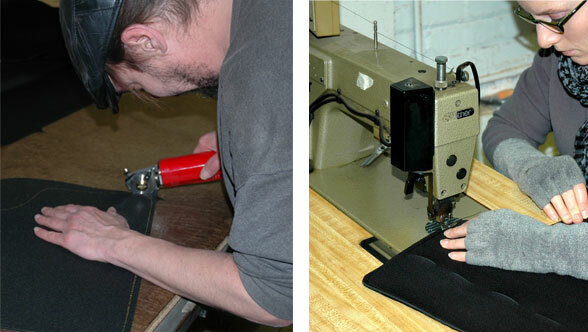 We make every product one at a time by hand and with our own machines. We make our own polymers, extrude and injection mold our own parts, do our own fabrication, sewing, inspection, boxing, shipping and customer service. Because of this, we can deliver the highest quality products in the shortest amount of time with no middle man or shipping from overseas. We can also offer extremely fast custom designs and prototypes to meet special needs. We also offer custom artwork if you need your company name or team logo on a product line. Ironwear® has been producing and developing health and performance enhancement equipment for 20 years and our staff is very experienced, so please let us help you. Our business in mostly wholesale to retailers, clubs, and trainers around the world. We do not have a retail outlet of our own at this point in time. About half of our current product line is available online or through our trainers and retailers. If you have a need that you do not see addressed on our site please contact arnold@ironwearfitness.com for assistance. Customer Service is available by phone Monday through Friday 8:30am to 4:30pm eastern standard time to answer any questions that you may have. Customer Service can be reached at 800-630-2779 or 412-782-2212. Customer Service is also available by e-mail seven days a week at arnold@ironwearfitness.com.